What is a Growth Hacker really? Where to get started in growth hacking? Where can I learn more about Growth Hacking? Growth hacking is one of the biggest buzzwords of the past years, so many people are asking “What is Growth Hacking?”. Consultants, marketers and entrepreneurs call growth hacking as the best way they grow a business, but what does it really mean? In this article I want to give a clear definition and explain step-by-step what growth hacking is and how it works. Growth Hacking is a new field and a combination of marketing, data and technology. A growth hacker runs experiments in a process-based manner to grow the number of customers. Growth Hacking is ideal for startups because of the limited budgets and resources, but it also lends itself to larger companies. Growth hacking started within the startups of Silicon Valley, but nowadays it has grown into a form of work that also applies to large, astablished companies. For those startups, growth hacking was their way to beat the established order; the big corporates. They had less resources and budget to work the same way as the big competitors and therefore they had to find alternative ways to market their product. Hence the word ‘hacking’ is used as a metaphor to grow in a different, cheaper and / or faster way. Why is growth hacking also relevant for large companies nowadays? Many companies see growth hacking as the perfect strategy for the 21st century, because you have to be flexible to avoid competitors, have to be quick to take chances and be data-driven because you do not want to spend thousands of euros on the basis of gut feeling. Growth Hacking is a relatively new term. 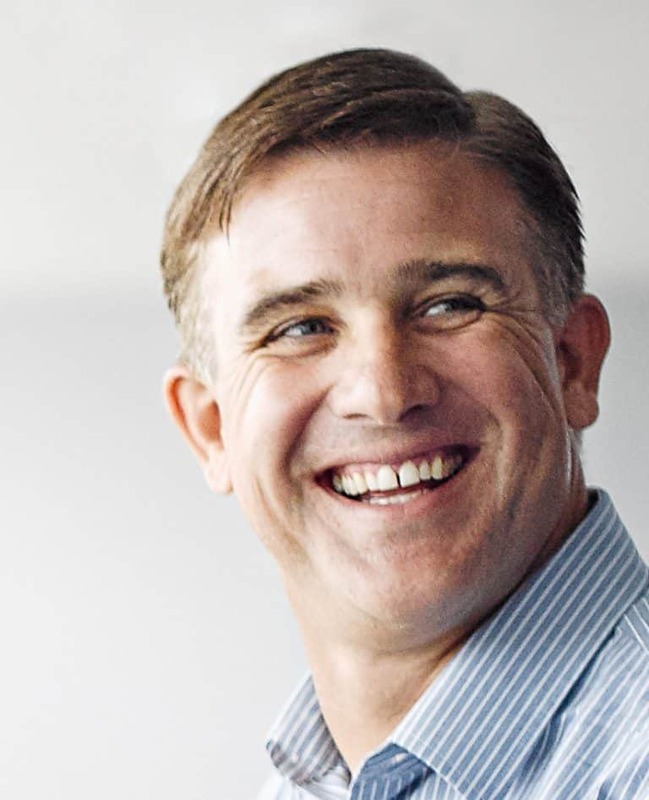 In 2011 Sean Ellis, then marketing manager of PayPal, coined the term when he placed a vacancy online for a ‘Growth Hacker’. He was looking for a successor for himself, but he was not really looking for ‘just’ an online marketer. He was looking for someone with knowledge of data, product, tech and marketing, and in addition, the person had to have a very specific mindset that fully focused on sustainable growth. 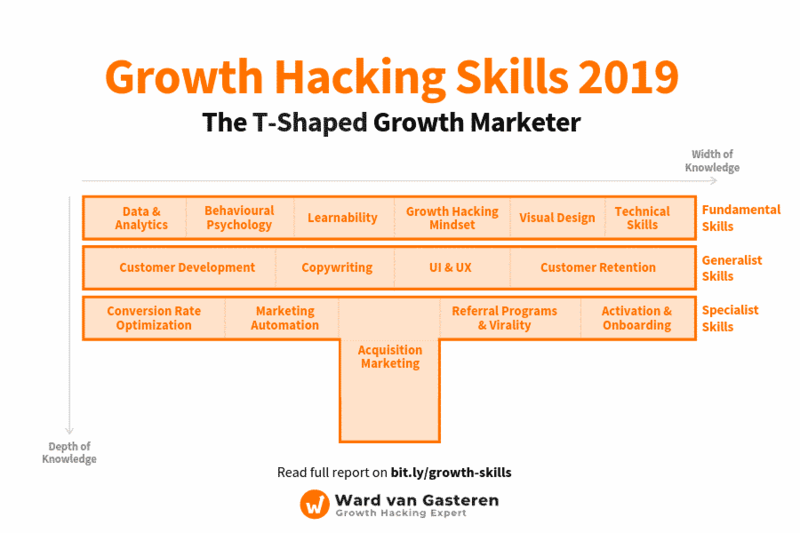 From that moment on, more people stood up and started calling themselves a growth hacker, growth marketer, technical marketeer, datadriven marketer or head of growth. They recognized themself in this mindset and saw the difference with traditional marketing. 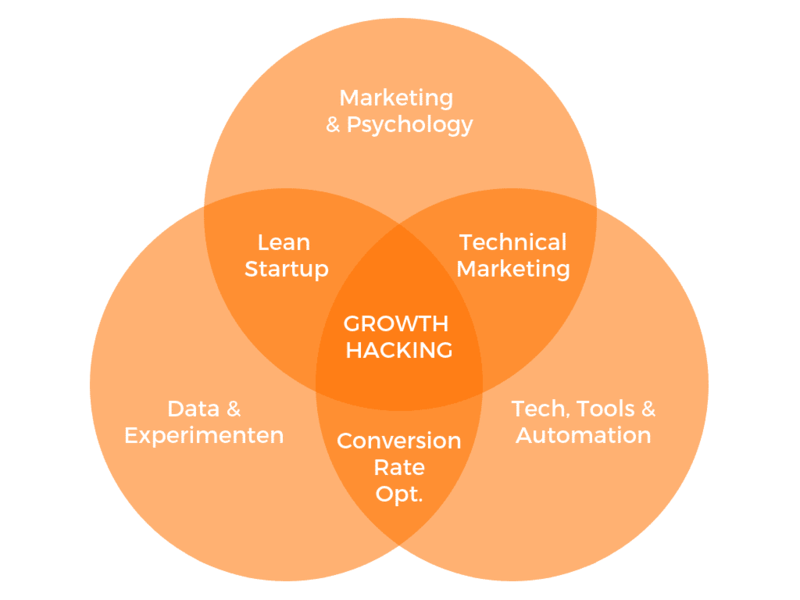 The question “What is Growth Hacking?” is such a difficult question, because it is above all a way of thinking / working. 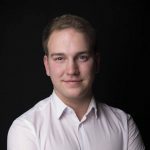 A growth hacker sets the goal above the means; revenue growth is his main goal and which channel, technique or tool is used for this is secondary. That is why it is so important that a growth hacker has a broad set of knowledge and skills. In terms of growth hacking skills, knowledge of data is necessary, because that is the only way to find your main problem and its cause. Then comes creativity to come up with solutions for this problem and finally, a growth hacker needs technical skills to bring these solutions to reality. This term was first used by David Guest in 1991. He described a T-shaped employee as “someone who specializes in being a generalist, but with an expertise in one or two fields”. A growth hacker, should have 20% of all the knowledge needed to execute 80% of the work. David Arnoux, co-founder of Growth Tribe, recently wrote an article on the skills of a T-shaped growth hacker. Nowadays, growth hacking is on the rise. Andrew Chen even said that the VP of Marketing will be replaced by a “VP of Growth”. For every startup or innovation project time, people and budgets are limited, so we have to be data-driven and always keep experimenting. Data is the safest route. For every 7 companies looking for a growth hacker, there is 1 growth hacker available who has the necessary knowledge. That is why we see a big rise of growth marketing agencies and growth hacking courses. In Amsterdam, the first growth hacking academy of Europe was founded at the end of 2015, Growth Tribe. I regularly hear people describe growth hacking as ‘marketing of the future’. I have to confess that the difference is not very big for some people and it just depends on how you look at it, so I want to apologize to the marketers who feel hurt by this post. Sorry. A growth hacker uses the entire funnel, where most marketers only look at Awareness and Acquisition. A growth hacker runs experiments; he tests which direction works best, where a marketer often focuses on one method. A growth hacker works data driven, where that is not the case for most marketing departments. A growth hacker has some technical skills, such as programming, tooling and automations. A growth hacker is involved in the product, because, among other things, he has to pay attention to the retention of active customers. A marketer focuses on the start of the Pirate funnel while the growth hacker uses the entire funnel. What is the Pirate funnel? 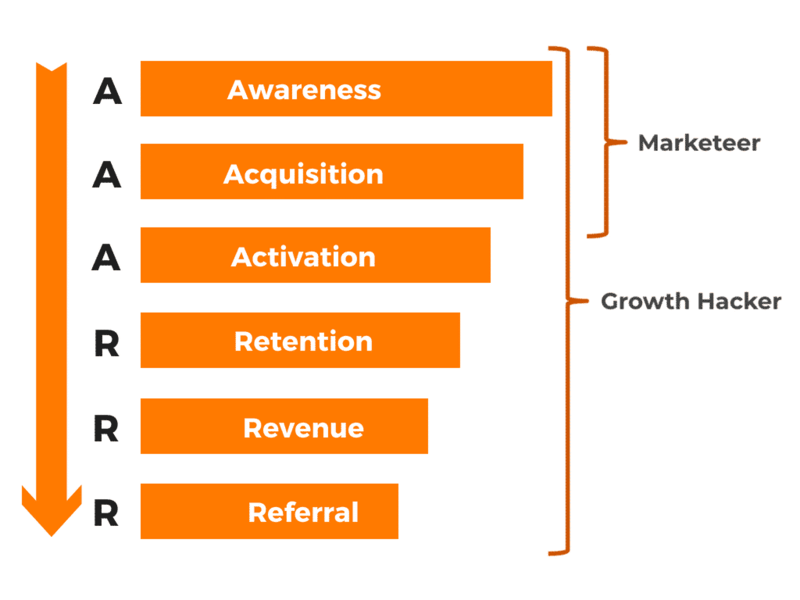 The Pirate funnel is a model by Dave McClure to cut a company in six phases: Awareness, Acquisition, Activation, Revenue, Retention and Referral. The first letter of the stages spell AAARRR, hence the name Pirate funnel. The shape of the model looks like a funnel, but others prefer it as a Pirate Hourglass. A marketer mainly focuses on the first two phases Awareness and Acquisition – How do I get more name recognition and more visitors on my website? 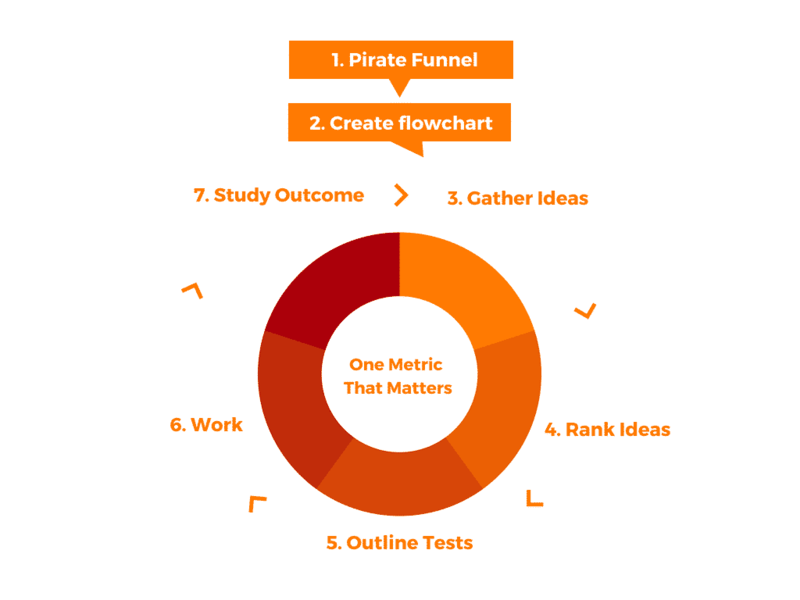 A growth hacker focuses on all phases of the Pirate funnel – Where is the biggest opportunity to grow our revenue? One of the most important wisdoms that a growth hacker must have is the realization that nobody knows what will work and what will fail. This applies to startup ideas, channels and conversion optimization. That’s why you’ll have to experiment. By trying a channel / tactic in a small experiment, you can avoid losing a lot of time or money. If during an experiment it appears that it doesn’t work, then you do not have to invest in it. If it does, you can continue exploring. In this way, a growth hacker ensures a higher ROI (“Return on Investment”) by spending time on the most effective channels. Here you can also see the big similarity between Growth Hacking and Lean Startup. Previously companies often worked with budgets that could be spent on anything and were often divided based on gutfeeling. Partly because the correct tracking tools were not available. Nowadays it is possible to measure everything we want to know within a website or app: scroll depth, mouse movements, time on a website, click-through-rates, etc. Why would we still make choices based on gutfeeling? Here you can see exactly how growth hacking originated in Silicon Valley, because startups often have the smallest budgets. Nowadays you see that this actually applies just as well to corporate innovation projects. And companies with large budgets prefer to spend their money as efficiently as possible. A growth hacker continuously monitors the ROI of his experiments and channels. That way you can always see your biggest opportunities and dangers and you know where you can get the most profit. For companies, “Survival of the Fittest” is very applicable; The companies that can adapt the fastest will survive the longest. That is why you must be able to take steps quickly as a company. That is why as a growth hacker you need technical skills so that you can make progress independently. If you are dependent on other people (specifically developers or designers) for each experiment, then that will slow you down tremendously. It is therefore much more efficient to at least master the basic skills and a large arsenal of growth hacking tools to work with. Which technical skills should a growth hacker have? Design and understand colors, fonts, branding, etc. Run ads on channels like AdWords, Facebook, LinkedIn, etc. Implement trackingtools like Google Tag Manager, Google Analytics, Hotjar, etc. And many more concepts/techniques, like conversion rate optimization, Artifical Intelligence in marketing, webscraping, chatbots, API’s, etc. Conclusion: a growth hacker has a much more technical set of skills than most marketers. Does the product match with the customer’s needs? Where is friction when using the product? Does the product provide sufficient value? How is this different from marketers? In product-development, a marketer is less involved, while a growth hacker should definitely be involved. He / she processes the usage data, observes the Net Promoter Score and suggests A / B tests to the product team (or executes them). Why does a growth hacker work like this instead of the traditional way? Well, sometimes the marketing just runs so smoothly that your product is a bigger problem / a harder bottleneck for your number of customers. Why would you not take this opportunity? The examples below are a few of the best known growth hacks. Dropbox was one of the first companies to use a referral program to make their customers work as acquisition channels. They offered users 250MB of extra storage space for every friend they would bring in as a new user. You could easily invite your friends via Facebook or Twitter, or import your email contacts to send them an automatic invitation. 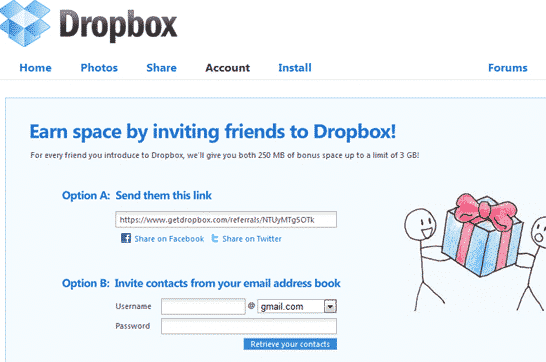 It was a great success and Dropbox grew from 100,000 users in late 2008 to 4 million users in early 2010! At the peak, 2.8 million invitations were sent per month. Most channels can’t compete with such a viral marketing strategy. The example of AirBnB is a good example of using someone else’s platform. AirBnB used Craigslist in their early years. Craigslist was at that time the largest forum where people could rent a house. This was therefore the place where their target group was most active. AirBnB began to place their own offer on Craigslist with a link to their own platform for potential tenants who sought more information. This way they managed to attract their launching customers from Craigslist and people kept hanging on AirBnB. As an experiment they first performed this manually and later made a bot that could automatically place it on Craigslist and attract people to their app. Hotmail was the first free email provider. At the bottom of all the emails from their users they placed the phrase “P.s. I love you” with a link to their own website. As soon as recipients visited the website and saw that Hotmail was free, they switched to Hotmail. In 18 months Hotmail went viral to 12 million users! Just to give you an idea: at the time there were ‘only’ 70 million people in the world with internet. This is a similar example as the Dropbox example. PayPal wanted to be placed as a payment option on Ebay, because they would receive a small commission per transaction. Ebay had no interest at first. Then the PayPal team manually approached big sellers on Ebay to buy their product with the question “Can I pay you via PayPal?”. The sellers did not know PayPal and therefore were losing the deal. 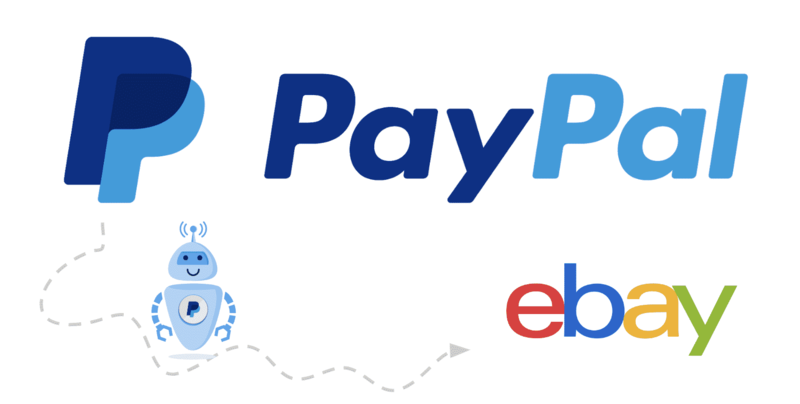 The vendors demanded from Ebay that they would integrate PayPal and after enough sellers had requested this, Ebay turned to PayPal. Look here for a list of 200+ growth hacking ideas made by Ladder.io, a Polish growth hacking agency. Or look here at growthhackers.com for the growth hacking examples of large companies such as Uber, Spotify or LinkedIn. You are curious by nature. You will probably have to learn a lot of new things via Google or Youtube about data and tech. You have a product / service that people are interested in and that is profitable. Otherwise Growth Hacking can not help you on its own. You know who your ideal customer is, why he/she buys your product, what other interests they have and where they ‘live’ online. You have set up your analytics (if you have installed your Google Analytics and possibly also Hotjar, you are already well on your way). You can manage your own website. Simply said, you can create new pages yourself and adjust your current texts & images. To begin with, you will look for the point in the Pirate funnel where you lose the most customers by percentage, starting between Acquisition and Revenue. The negative thinking canvas might be helpful for this task. Then you look for the cause of the problem why so many people drop out of your funnel by asking customers about it or looking at customer behavior via Hotjar, for example. Finally, you will try a few solutions (remember: start small!) and see if it delivers anything. For example: Does my conversion rate improve if I give people a free trial of the product? Or: How much longer does a user stay active in my software if I send them daily, educational emails? Just try! Google your question. If you search on Google (in English), there is a lot of good content available which might help you. You can send me an email. I may not have time right away, but I’m happy to help you, so just send an email to ward@growwithward.com. You hire a growth hacking agency. I made it easy for you and made a list of the best growth hacking agencies in the Netherlands and Belgium. I myself also work as a freelance growth hacking consultant. Growth Tribe is the first growth hacking academy in Europe and by far the biggest. Each year they train around 2,500 people from their Growth Tribe campus in Amsterdam or in-house at companies. They provide 2-day, 6-week and 3-month courses on various topics such as AI, blockchain and growth. Since 2018 they also have campuses in London, Paris and a few nordic countries. The Talent Institute has a paid traineeship for growth hackers as a part of StartupBootcamp. Right now they are still only in Amsterdam, the Netherlands, but there are rumours they are moving abroad as well. GrowthRocks is also setting up a growth hacking universities in Athens, London and Bucharest. And there are also a lot of agencies who provide in-house workshops worldwide, like Growth Tribe and GrowthRocks. If anything is unclear, if you need my help or if you want to add something to this blogpost, feel free to send an email to ward@growwithward.com.